Flatbread is a quick and easy type of bread that you can make from scratch at home without needing special skills. 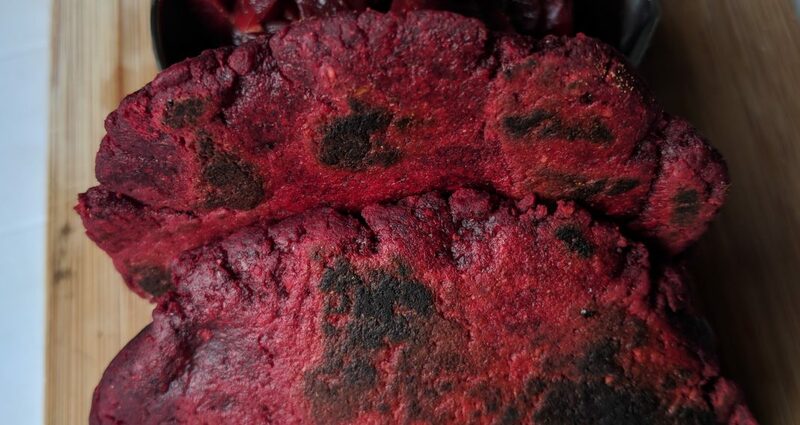 This recipe for beetroot, barley and oat flatbread uses dried beetroot powder and barley and oat flour. Barley and oat flour can be used as alternatives to wheat flour. While oats, as long as they are not contaminated by contact with wheat, are gluten-free, barley contains a small percentage of gluten (about 5%), making it unsuitable for people who suffer from celiac disease or have a gluten sensitivity. 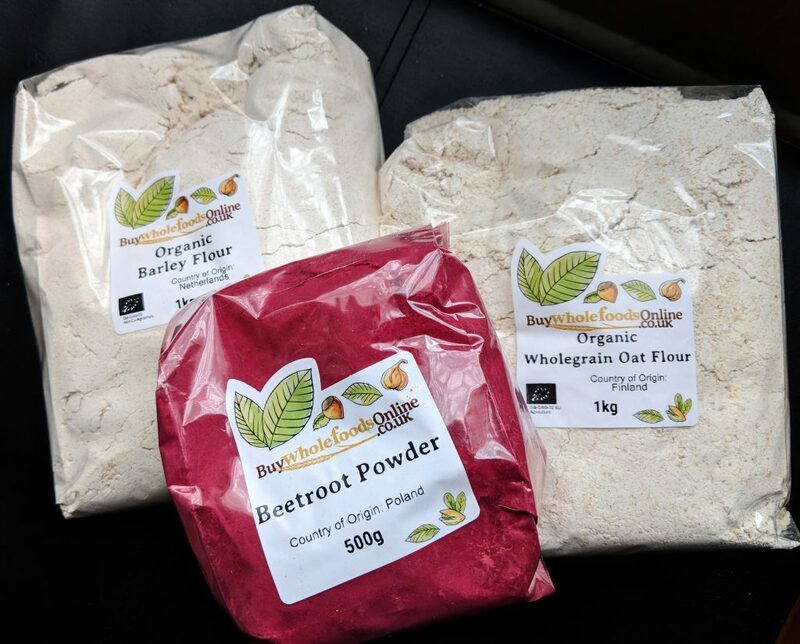 I was kindly sent some samples of barley and oat flour by BuyWholeFoodsOnline, a company based in Kent, UK. 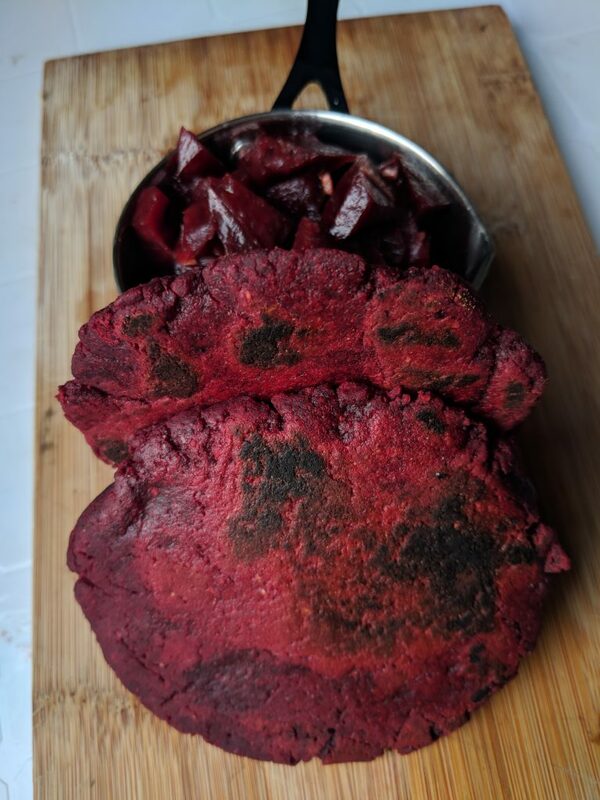 I thought it would be interesting to experiment with different flavours so I asked if I could also use beetroot powder for colour and taste. BuyWholeFoodsOnline is an international health food supplier specialising in high quality organic wholefoods. Their vast product catalogue includes raw ingredients for baking and cooking, vegan foods including meat and dairy alternatives, as well as prepared healthy snacks like energy bars, rice cakes and kale chips. 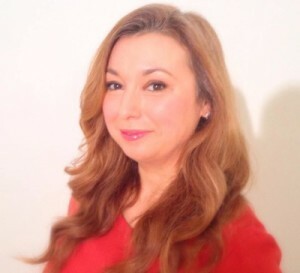 I combined different recipes finding inspiration from Nigel Slater among others. 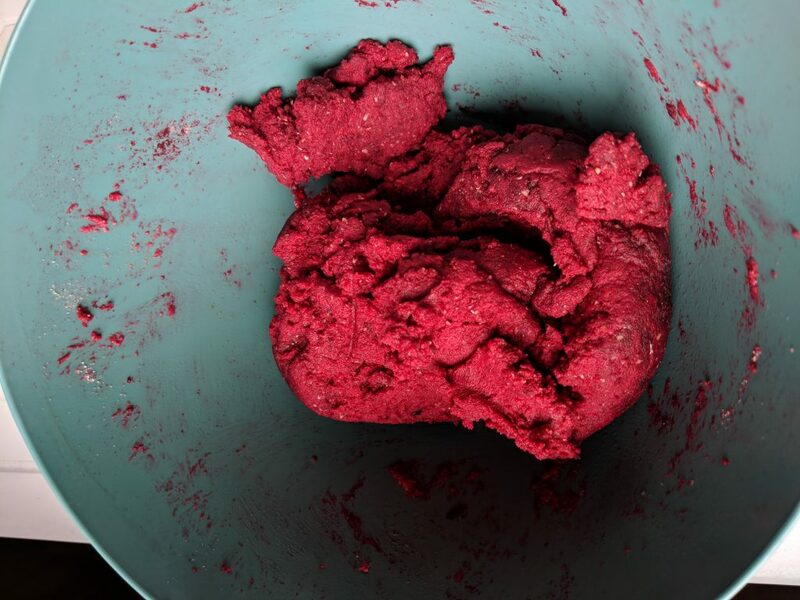 In a bowl, mix all the dry ingredients together: the two flours, beetroot powder, dried yeast and salt. Slowly add most of the water and let it absorb, add the vegetable oil and the remaining water. You should obtain a smooth dough, quite dense and a bright pink colour. Leave to proof for 2 hours covered (damp towel, cling film or a lid over the bowl are fine). Divide the dough into four balls then rest for five minutes. Roll out the dough balls into circles ½ cm thick and about 15 cm wide. If you prefer, you can flatten the dough using the palms of your hands. Heat up a heavy frying pan, either non-stick or cast iron. When it’s about to smoke, place one or two flatbreads depending on the size of the pan. Cook for 2 minutes on one side, turn over, cook for another 2 minutes. Then, repeat cooking for a further 1 minute on each side. Serving suggestions: serve with a simple cooked beetroot salad seasoned with salt, minced garlic, balsamic vinegar and extra virgin olive oil. Alternatively, why not make a Polish borscht beetroot soup? The flavour of the flatbreads is slightly chocolately and they smell similar to dark chocolate, with their rich aroma deriving from the beetroot sugars and from toasting the barley flour in the pan during cooking. If you prefer, you can add more salt when preparing the dough depending on your preference. The texture is tightly aerated and cake-like, with a pleasant softness. I cooked the flatbreads in two batches: the first one after proofing the dough for two hours, the second the following day after proofing for 18 hours. The flavours had a chance to develop overnight, and the end result was an enhanced savoury note and less sweetness. The flatbreads still had a chocolate scent but they tasted more like bread, as the fermentation process had broken down the sugars. 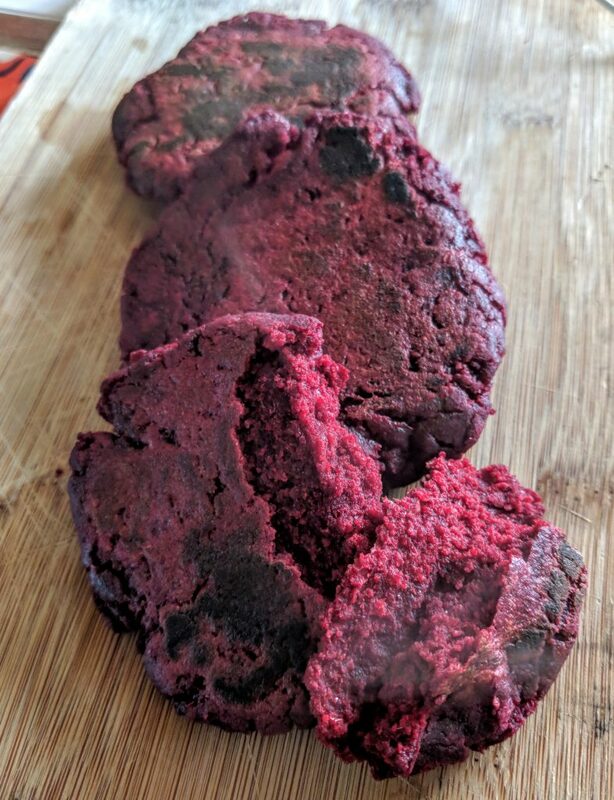 If you prefer your flatbreads to be less sweet, I would recommend resting the dough overnight, and possibly adding less beetroot powder. Because of the low gluten content of the flours, the dough will not rise much and may not stick together like with wheat-based flour, however the flatbreads did not fall apart while cooking. Related recipe: homemade pitta bread.